Vena is a powerful budgeting, planning and forecasting software solution designed for enterprises and organizations that want to create and implement foolproof budgets for their operations, purchases, acquisitions, and more based on reliable financial data and analytics. The software provides users with a centralized budgeting solution that offers automation of their workflows and processes, absolute version control, reliable audit trails, user permissions, and more. Vena’s strength lies in shortening the typical budget cycle, with a drag-and-drop budget process design tool to map out the automation process. Specific tasks can be easily assigned to any team member, with possible contributions from any stakeholder. The automated routing, review and approval workflow allows you to monitor each step carefully and flush out bottlenecks and revisit your process accordingly. Simply put, Vena is a huge transition from boring and confusing spreadsheets that are prone to errors and plagued with technological limitations. Users will definitely appreciate how budget planning and execution become a streamlined process. Financial data are sourced from various systems and applications and are automatically consolidated, organized, and analyzed to help generate feasible budgets that adhere to the company’s policies, specifications, and other preferences. The precise version control ensures your team is working within the allowed budgets, with tight user permission controls to eliminate the occurrence of multiple budgets that can wreak havoc on your finances and operations. Vena takes care of gathering and consolidating financial information from various sources, including accounting systems, ERP systems, and more. It automatically organizes all your information and puts it all in a centralized database, free from duplicate entries, erroneous figures, and other forms of errors that stem from manual processes and human intervention. As a result, Vena works with information that is consistent across all systems and even the entire organization. It organizes and analyzes your financial information essential to the creation and implementation of the budget. It quickly delivers budgets that are reliable and executable and aligned with your targets and goals. Budgets are a complex yet critical aspect of running a business. Thus, it is imperative that budgets are immediately reviewed and approved/declined so that other processes and workflows dependent on budget move along as well. With Vena, you can configure the approval process and automate specific workflows to ensure that your budget cycle runs smoothly. You can assign team members to perform specific tasks at particular points and automatically deliver notifications to stakeholders at certain stages. The software also helps you recognize pain points and bottlenecks so you can quickly address and solve these issues long before they blow up and become serious problems that stagnate your budget process. Vena is ultra powerful without the complications required to run the software productively. Any user without the technical background of software experts can easily pull out relevant data from the unified database and generate models or reports that matter for leadership to act on. KPI and executive dashboards are sweeping and easy to understand, and they can be generated right inside Microsoft Excel. Managers may also access the database and execute their own what-if schemes to help them come up with deeply informed decisions and course of actions. If you are stuck with crucial data in Excel, you need not worry about leaving Excel and opening Vena to input and process the Excel data: Vena extends its capabilities right inside Excel so you can generate the required calculations that you need. Vena works with Excel almost natively, so you can have a peace of mind that your Excel data can work seamlessly with Vena’s sophisticated computing power to produce the numbers that you need. What Problems Will Vena Solve? Problem #1: Collecting and aggregating budgeting data is often manual and time-consuming. Vena automates the budgeting process, often reducing cycle times by 50 percent. Problem #2: Finance teams want to do data-driven strategic planning and deliver more accurate predictive and prescriptive revenue forecasts. By drawing on real-time data from sales, marketing, customer care, and finance, Vena provides top-level insight by diving deep into the most important indicators of your business growth, including cash flow, customer acquisition cost (CAC) and customer lifetime value (CLV). With Vena, CFOs can be more agile and data-driven in the financial guidance they provide to departments across their organizations. In turn, they can work more effectively with other department leaders to turn organization-wide revenue goals into detailed departmental objectives. Problem #3: Organizations struggle to keep departments working off common data sets, essentially creating multiple versions of the truth. With Vena all of your data is stored in a secure database and updated in real time, reducing the need for manual data entry by up to 75 percent. You’ll improve the accuracy and integrity of your data and eliminate issues with version control. It's important to realize that virtually no software in the Accounting Software category will be an ideal solution able to fulfill all the needs of different business types, sizes and industries. It may be a good idea to read a few Vena reviews first as some software might dominate just in a really narrow group of applications or be designed with a very specific type of industry in mind. Others can operate with a goal of being simple and intuitive and consequently lack complex features needed by more experienced users. You can also find solutions that support a wide group of customers and offer a complex feature toolbox, but that in most cases comes at a more expensive cost of such a service. Ensure you're aware of your requirements so that you select a service that offers exactly the functionalities you look for. How Much Does Vena Cost? Interested parties need to contact Vena Solutions for information on their Budgeting and Planning Software’s basic and enterprise pricing packages. 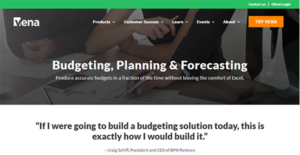 We realize that when you make a decision to buy Budgeting Software it’s important not only to see how experts evaluate it in their reviews, but also to find out if the real people and companies that buy it are actually satisfied with the product. That’s why we’ve created our behavior-based Customer Satisfaction Algorithm™ that gathers customer reviews, comments and Vena reviews across a wide range of social media sites. The data is then presented in an easy to digest form showing how many people had positive and negative experience with Vena. With that information at hand you should be equipped to make an informed buying decision that you won’t regret. What are Vena pricing details? What integrations are available for Vena? If you need more information about Vena or you simply have a question let us know what you need and we’ll forward your request directly to the vendor.